London, New York, Chicago – 15 November 2017 – Vela, the premier market access technology provider, today announced the launch of its Systematic Internaliser (SI) Data Hub, part of its comprehensive MiFID II solution suite. Vela also confirms the addition of Sun Trading as part of its roll-out of new Systematic Internaliser venues. Vela’s SI Data Hub provides clients with access to multiple SI liquidity price feeds through a single normalised API, helping to address MiFID II concerns regarding best execution and liquidity fragmentation when it takes effect on 3 January 2018. The Vela SI Data Hub supports the SI Consolidated Book providing clients with a single, consolidated Best Bid Offer (BBO) view of multiple liquidity sources to support price discovery and aid best execution. Based upon Vela’s feed handler technology, the SI Data Hub combines a low latency, high performance solution with Vela’s normalised market data model. Offered as a dedicated fully-managed solution in Equinix Slough, the SI Data Hub allows clients to receive their own bespoke, individual SI price feeds through a single connection. The SI Data Hub is also available as a software-only solution to run in-house for new deployments or as an addition to existing solutions. The SI Data Hub offering is complemented by Vela’s SI Execution Platform which provides clients with a single, low latency order routing platform to multiple Systematic Internalisers. Vela’s SI Data Hub is part of a wider range of SI and MiFID II solutions including European Best Bid Offer (EBBO), support for Periodic Auction venues, enhanced Kill Switch functionality, and ongoing maintenance of exchange-driven changes. For more details on Vela’s full suite of MiFID II support and functionality, please contact us at sales@velatradingtech.com. Vela is the premier market access technology provider, delivering low-latency access to over 200 venues, coupled with a unique set of trading tools, data, and analytics, flexibly delivered with exceptional global support. Vela acquired OptionsCity Software and Object Trading in 2017. 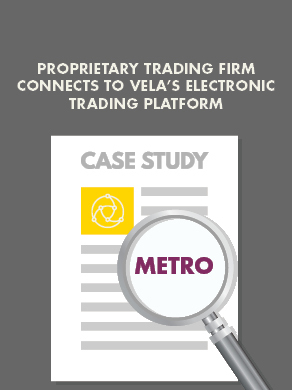 Now as one organization, Vela provides a comprehensive, end-to-end solution for multi-asset electronic trading with global market coverage, enabling smarter access to global liquidity. Vela has eight offices in the US, Europe, and Asia supporting traders, market makers, financial institutions and other market participants worldwide. Sun Trading is a global market maker in multiple asset classes providing liquidity to over 115 exchanges, trading venues, and counterparties in over 15 countries. Since its inception in 2003, Sun Trading has been a leading market maker, focused on passive liquidity provision and price improvement for investors. Headquartered in Chicago with offices in London and New York, the firm employs more than 100 people globally. For more information please visit: http://suntradingllc.com.